XLR8 Clutch System - Excelerate Performance - European, Exotic and Japanese Performance Specialists!! XLR8 Clutch Systems are the result of many years of testing, experience and design. Frankly, we felt the clutch options on the market didn’t meet the needs of our customers so we worked very closely with a performance partner who specializes in clutch design and manufacturing to create a true clutch system that is durable, capable, and powerful. In other works it can handle your performance needs while still maintaining the drivability we’ve come to expect out of a clutch system. The XLR8 clutch kits are a custom made, private label application designed specifically for your vehicle and come in a number of options, including Daily, Street/Strip and Drag. This clutch kit was engineered for those with bolt on modifications.This kit includes a heavy duty pressure plate, which has an increased clamp load with little or no increase in pedal pressure. The organic disc material has a high metal content that increases the co-efficient of friction by two times over a stock lining and increases rotational strength up to a 12,000 RPM burst point. Overall, this clutch system maintains a stock feel while offering strength and durability. The recommended usage is for a vehicle that is driven daily, for street performance or even a moderate race application. Torque capacity will be roughly 340 ft/lbs. This clutch kit was engineered for the street/strip climate. The pressure plate is precision balanced for vibration free operation at high RPMs.The friction material is a kevlar design. The recommended usage is for a vehicle that is driven daily, for street performance or even those used for rally or endurance racing. Torque capacity will be roughly 425 ft/lbs. 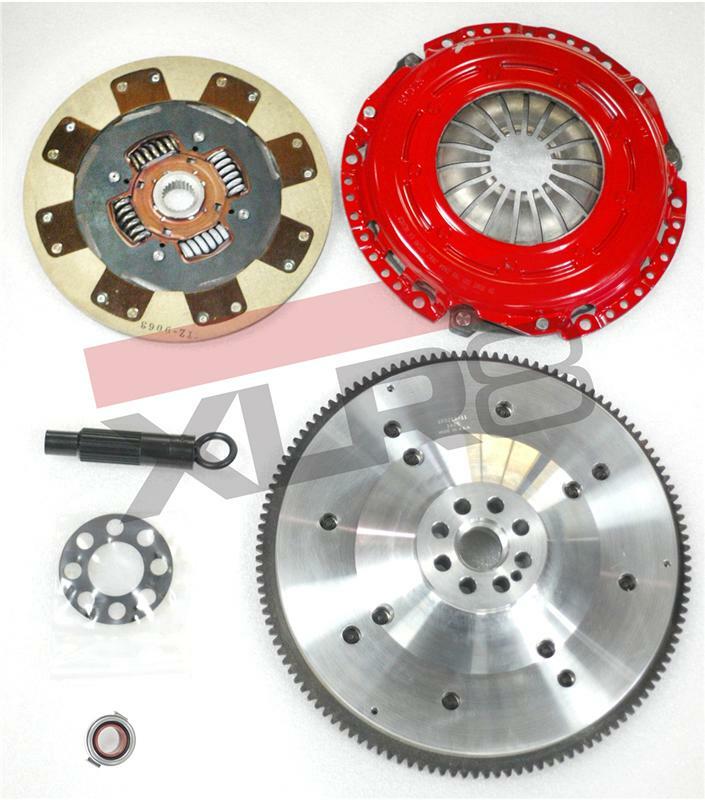 This clutch kit was engineered to handle heavily modified cars and designed to function according to the specific needs of the drag strip/track. Discs are a segmented puck design (6 puck setups available), which reduces rotational mass and are assembled with all high carbon component pieces for maximum strength. The friction material used is graphite-impregnated ceramic, which is perfectly suited for drag racing because of its maximum friction co-efficient, rapid heat dissipation, and abrupt engagement characteristics. The recommended usage is for a vehicle that is used for drag racing or drifting. Torque capacity will be roughly 500 ft/lbs. The XLR8 flywheels are made by AASCO Motorsports. AASCO has been manufacturing flywheels for over 20 years. Their unique ability to manufacture thousands of the highest quality OEM replacement light-weight flywheels as well as several hundred custom variations differentiates them from the competition. AASCO maintains a high level of quality control. Each clutch kit and flywheel will be supported by the manufacturer’s warranty. Inquire for details.